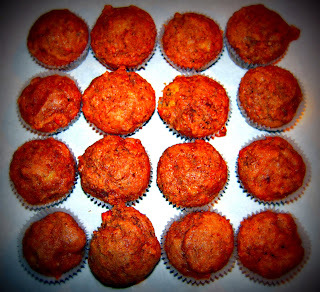 The Sneaky Mommy: More Muffins! You may have noticed the influx of muffin recipes lately. Little Miss Cloe gets to take a healthy snack to school everyday this year. She's probably the one child in the world who hears the words healthy snack and takes it as law, her law. Don't get me wrong, I love that she enjoys and asks for healthy snacks. However, it presents a little conundrum when healthy snacks, in her definition, only include homemade healthy muffins. She has all sorts of criteria for the healthy snack: must not be bruised or browning fruit (I think that just naturally happens the moment the fruit hits her backpack! ), must not require refrigeration, must not be room temperature vegetables, must not be a pre-packaged granola bar unless it's Kashi and can absolutely not be junk food. These sound snotty or picky, and really they're not. They are well-meaning requests from my most appreciative, oober healthy snack conscious little girl. I giggle when I hear her tell how bad the boys at school smell after eating those "cheesy chips" or how they get "black stuff" all over their teeth from oreos. I wonder how long that will last! Now, if the letter to parents hadn't said healthy snack, she'd probably be begging for those things, too! I'll take the extra work for now! Tomorrow's healthy snack: Banana Flax Mini Muffins! I tried one, and they are the tastiest banana muffins I've ever tasted...if I can say so myself! Try them...you won't regret it! Pre-heat oven to 400 degrees. Combine all ingredients. Stir until moistened. Spray muffin pan or pour batter into muffin cups 3/4 full. Bake 8-9 minutes for mini-muffins or 18-20 minutes for regular muffins. Oh... that does look good!!! Tried these yesterday! It was the first time I tried muffins (& honey) with the boys. It was a hit! Thanks.